There’s nothing like the excitement of watching your child lose their first tooth; and it helps that most baby teeth come out on their own. But occasionally, baby teeth need a little help to move things along. When teeth are badly decayed or damaged, or when baby teeth start to crowd adult teeth coming in, it may be necessary to consider having your child’s teeth extracted. This isn’t as scary as it sounds. In most cases, a tooth extraction for your little one is a simple procedure, and needn’t cause any worry in you or your child. Why Do Children Need Tooth Extractions? Extraction is required to help orthodontic treatment: removing a tooth can reduce crowding and allow your orthodontist to straighten neighboring teeth. What Does Tooth Extraction In Children Involve? Getting a tooth pulled may cause a little anxiety for both parents and children, but in most cases, the procedure is straightforward and less involved than a tooth extraction in adults. Your dentist will start with an X-ray to check out the tooth’s roots and bone condition. A simple extraction typically only requires a local anesthetic. Your dentist then removes the tooth with forceps, moving the tooth in the socket and rotating it to separate the periodontal ligaments that attach the tooth to the jawbone. Remind your child (and yourself) that a little bleeding is normal following an extraction. Your dentist will apply sterile gauze to the affected area directly after the tooth is removed. In some cases, a few small stitches may be needed to help the extraction area heal. The gums will quickly form a protective blood clot, and it’s important to keep that clot in place to avoid dry socket, a painful condition that happens when the clot is removed and the underlying bone is exposed to air, food, and liquids. To allow the protective clot to form, avoid rinsing for the first 24 hours. Then rinse with salt water to make sure the area stays clean and help reduce pain. You can give your child Tylenol or ibuprofen to help with pain and use an ice pack outside the jaw for mild swelling. Call your dentist if your child gets a fever or if you notice excessive swelling. If there are any signs of an infection, your dentist may prescribe antibiotics. Your child should eat soft food for the first few days and avoid hard or crunchy foods for at least a week to make sure the extraction area stays clean and the protective clot remains in place. Encourage your child to drink plenty of water to keep their mouth clean and remain hydrated. Baby teeth are in some ways placeholders for adult teeth and help guide the permanent teeth as they come in. If a baby tooth is removed because of damage or decay before the permanent teeth are scheduled to arrive, your dentist may recommend a prosthetic tooth to make sure the new tooth comes in correctly. But if the permanent tooth is not far off from coming in, a prosthetic tooth won’t be needed. Pediatric tooth extractions are common and generally simple. But having a pediatric dentist in charge of the procedure gives many parents peace of mind. Pediatric dentists receive additional training in oral development. They are keenly focused on treating baby teeth, predicting when permanent teeth will come in, and in using anesthesia to aid in an extraction. 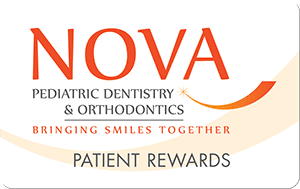 NOVA Pediatric Dentistry and Orthodontics is a knowledgeable, skilled partner in keeping your child’s mouth healthy, and helping those adult teeth arrive in just the right place. Contact us today for more details!